Here I show you how I have solved the problem. To start with we need a web page we like and which is similar to what we envisage ourselves for our website. Keep in mind, we can’t just save and use a page we like! Web pages, pictures, scripts etc are subject to copyright and could not be used without owner’s permission. Luckily for us, there is a number of websites where one can find web templates that can be used free of charge thanks to their authors. I have used this one. It contains great variety of web templates, so there is good chance you can find something similar to what you are looking for. I have chosen this template, courtesy of Free CSS Templates (web design) and Mark James (icons). The template comes with Creative Commons Attributions 2.5 license and as authors wrote “…you’re pretty much free to do whatever you want with it (even use it commercially) provided you keep the links in the footer intact. Aside from that, have fun with it :)”. In a sense of copyright, this is exactly what I’m looking for. Here is explanation what each layout type is about with examples, if you are interested. For purpose of this post you just need to remember that fixed-width layouts are the easiest to work with among listed above and if you have a level of skills in web design similar to mine, I strongly recommend you to choose a template with fixed-width layout. The template which I have chosen has three-column fixed width layout. As I mentioned, it has three column layout. I want two column layout, so we have to remove third column (“Add space” one) and adjust width of remaining ones. Also we need to change the site logo, remove “Free CSS Templates” text on top (not at the bottom!) and do several lesser tweaks. I will be using the one which comes with Ubuntu (a version of Linux which runs on my laptop) and can be installed via Synaptic Package Manager. Of course, it has much more functions that are worth learning; but this is outside of the post scope. First we need to download the template, unzip it to a hard drive and open the page in Firefox. Next we are going to remove the third column. Now you see HTML code at the left side of Firebug window. You can navigate through it. 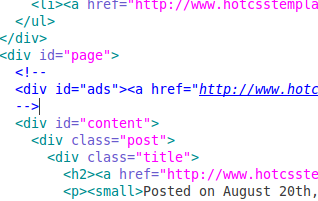 Each time you put cursor at any HTML tag, Firebug highlights corresponding area withing HTML page. As we can see, the div width is defined in line #217 of a file named default.css and it is 430 pixels at the moment. Now let’s remove “Free CSS Templates” text at the top of the page. This time we are going to use a text search in the text editor where we have index.html open. It appears to be a link. Let’s comment it out as well. I don’t have a logo for the application, so let’s replace temporarily “Mr.Techie” with “Squirrel2” (the name of the project). We’ll put there a real name later. To do this I again use text search in the editor etc. I don’t need the electrical bulb picture (the one next to logo) on my page, but I will keep it for now as a placeholder so that to replace it with something else more relevant to my application later. ScreenRuler shows that width of the right column is 250 pixels, so let’s change the width of the search form to 250 pixels and reload the page. Well, the result is not entirely satisfactory – the form width remains the same (200 pixels), it just moved a bit to the left. This is because the actual image we see as the search form is defined by img02.gif picture which is 200 pixels wide. To solve the problem we need the same picture but wider. Visually it would look better though if we had an image a bit narrower than the column (230 pixels wide) centered with regard of the right column. We will make the form 240 pixels wide (by editing CSS as above) and the image itself 230 pixels wide. That’s all for now. We’ll continue in one of the next posts. Well, I’m about to start development of a social application (Squirrel2 project) and I have to decide on what technology stack I’m going to use. This is a very important decision: making a wrong technology choice can easily result in project failure. Do I really need all this software? I don’t think so. Their development may be not complete at all. Most new social applications (with some exceptions like Google+) are developed either by individuals or small teams with very modest financing. In both cases resources are very limited and there may be just not enough time or money to complete development. This is very true in case of Squirrel2 – I have just around 500 hours for the whole development accordingly to my one year challenge. So the bottom line is: the initial technology stack should be such so that to allow launching the first version of the application as soon as possible and with as less investment and development as possible. The initial version of Twitter was built in Ruby on Rails. The initial version of Facebook was built on PHP. And what about scalability, ability to serve millions of concurrent users? I wish I had that problem 🙂 Those issues will be dealt with when and if it becomes necessary. I have been thinking of the technology stack for some time. Here is what I decided to use. Since my main competence as a software developer is in Java, I could choose that language as the main technology. However it would be somewhat boring… I want to learn new things, remember? So after some research I have decided to use Grails. A primary reason for this is that it is a rapid development technology. Yeah, I know it was inspired by Ruby on Rails, so should I have used RoR? I just happen to like Groovy (the language used by Grails). I think it yields in a very elegant and easy-to-understand code which I consider very important qualities. Absence of those qualities is the reason why e.g. I did not select Scala and Lift which I evaluated as well; to me Scala code is just somewhat cryptic and difficult to read. Groovy produces quite compact code, about twice shorter than corresponding Java code. This is also a very important advantage in my opinion. Groovy++ and Java (ability to mix Groovy and Java, to be precise) offer a clean and easy gradual path to future performance improvements in case I would need improve it. RoR does not offer a similar path as far as I know. Ability to mix Groovy and Java allows leveraging a huge collection of high quality open source software that Java accumulated over time (remember, my goal is to minimize amount of development). Grails comes with a lot of plugins that provide functionalities I hope to leverage. Grails community is vibrant. In short, Grails is “what the doctor prescribed” 🙂 Decided: my choice is Grails. Grails is mostly used with relational databases. I could use e.g. MySQL which have worked well for me in my previous projects. However this time I have something else in mind – namely, NoSQL DBs. I think NoSQL DBs are a part of a major paradigm shift happening right now in IT industry and I want to have hands on experience with those technologies. Funny enough, unlike much hyped Web 2.0 or SOA this paradigm shift, which in my opinion is much bigger and more important than those two, happens almost unnoticed. I will write a post or two on the paradigm shift and NoSQL DBs soon. There are Grails GORM plugins for several NoSQL databases: MongoDB, Riak, Redis, HBase, Gemfire. Hbase is for huge data grinding facilities; it is too big for my needs. Gemfire is proprietary, so I am left with MongoDB, Redis and Riak each of which is quite good. I will think a bit more of this and I will describe my choice later in a separate post. Naturally, social applications use web technologies at their presentation layer. So will be Squirrel2 doing. I plan to use HTML5 and Rich Internet Application technologies. In particular, I consider using jQuery, jQuery UI and plugins to them. I like very much architecture of jQuery and actually it is a sort of standard de-facto in modern web GUI technologies. That’s all for today. I will describe my choice of tools and supporting technologies in the next post.